Aww, dude. Thanks! I've enjoyed getting to know you too and means a lot that I've inspired anyone to start blogging. You've got a good one too, so that makes it even cooler. 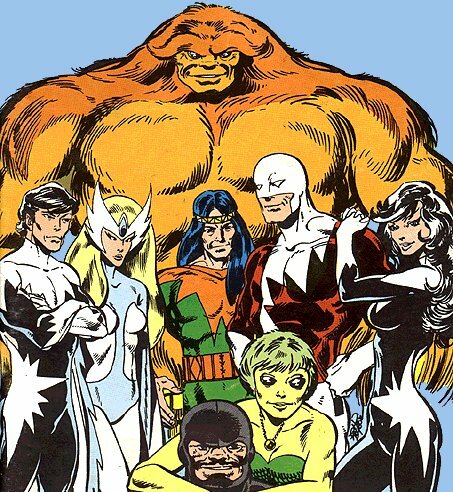 And that's a very cool Alpha Flight image. Where's it from? It's obviously Byrne, but I don't remember seeing it before. In all honesty I wrote this post and found the picture about a week and a half ago. I know I just google image searched for a good group shot but I don't remember the source. I just knew I needed a good Alpha Flight pic and what I know so little about them that it's criminal. I'm kind of amazed the site was able to handle a week's worth of scheduled blogs.